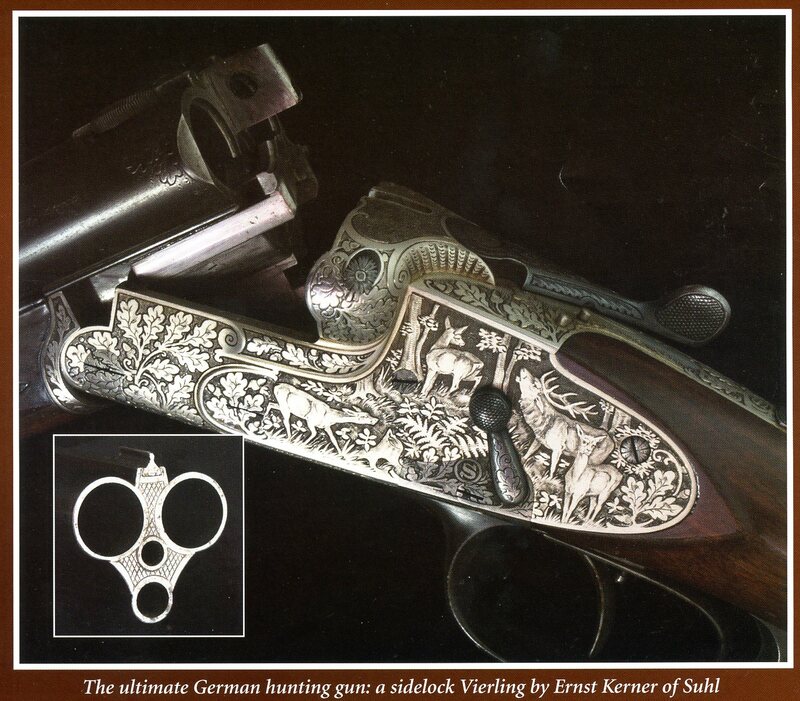 The Kerner family in Suhl has been involved in the Gun Making trade since the 17th Century. Hans-Jürgen Fritze in his book Heimat der Büchsenmacher states that in 1606 a Hans Kerner and his son Hans Kerner the younger were recorded as working at that trade. In 1890 Emil Kerner (1863-1940) started the firm Gewehrfabrik Kerner & Sohn at Trübenbachstraße 3 in Suhl. Later he relocated to Judithstraße 57. 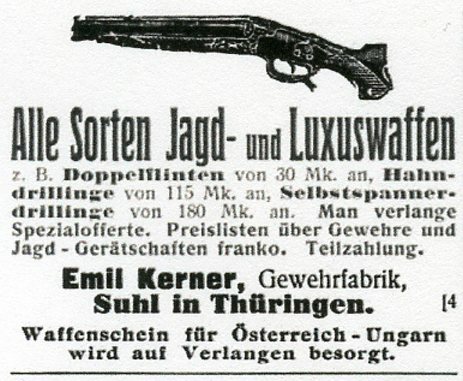 Emil had two sons – Ernst and Franz who followed him in the gun making trade. 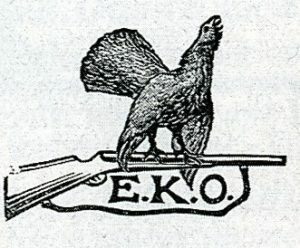 The Trade Mark “EK” was registered by Emil Kerner in 1903. The “Sohn” (son) referred to in the Company name was Franz. 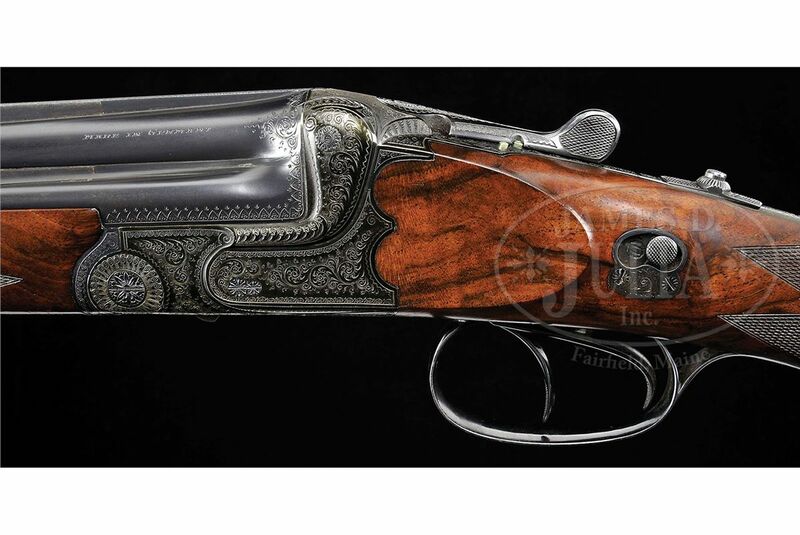 According to Hans-Jürgen Fritze Archival documents in Suhl show that in 1914 Ernst was registered or recorded as a büchsenmacher or gun maker on his own and the addition of “Co.” to his firms name was to give the impression that the firm was a serious one or lager than it really was. In 1919 Ernst Kerner and Karl Funk formed a firm known as Kerner & Funk which was located at Lutterothstraße 7 in Suhl. It is believed that this partnership only lasted about 5 years. 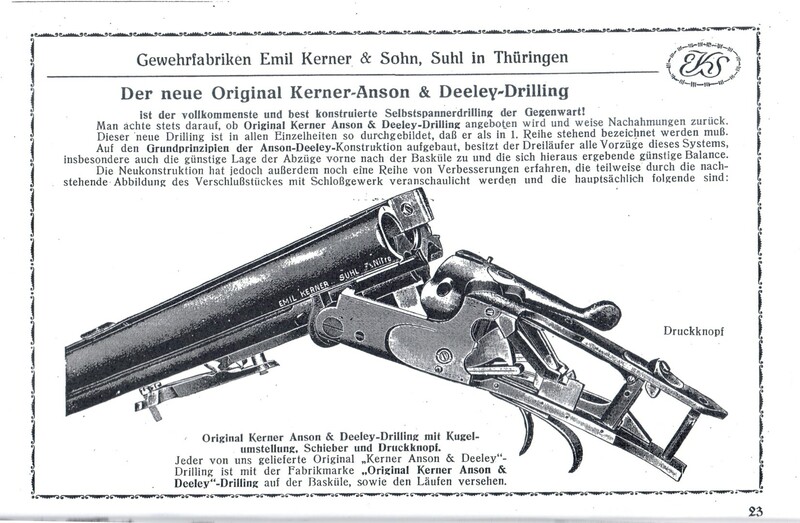 Then the business apparently returned to Ernst Kerner & Co. until 1946 when the Soviets dismantled the Company. 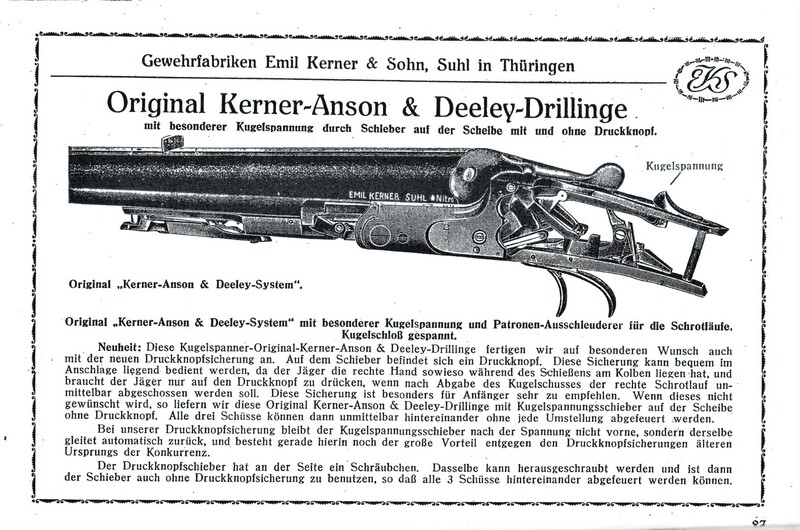 The following E. Kerner Drilling was recently sold by the Rock island Auction Co. Photograph courtesy of the Rock Island Auction Co. The following Emil Kerner Catalog pages are courtesy of Fredrik Fránzen in Sweden. 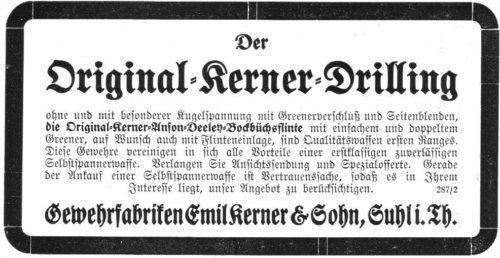 An advertisement for the Ernst Kerner & Co. showing the Auerhahn trade mark. 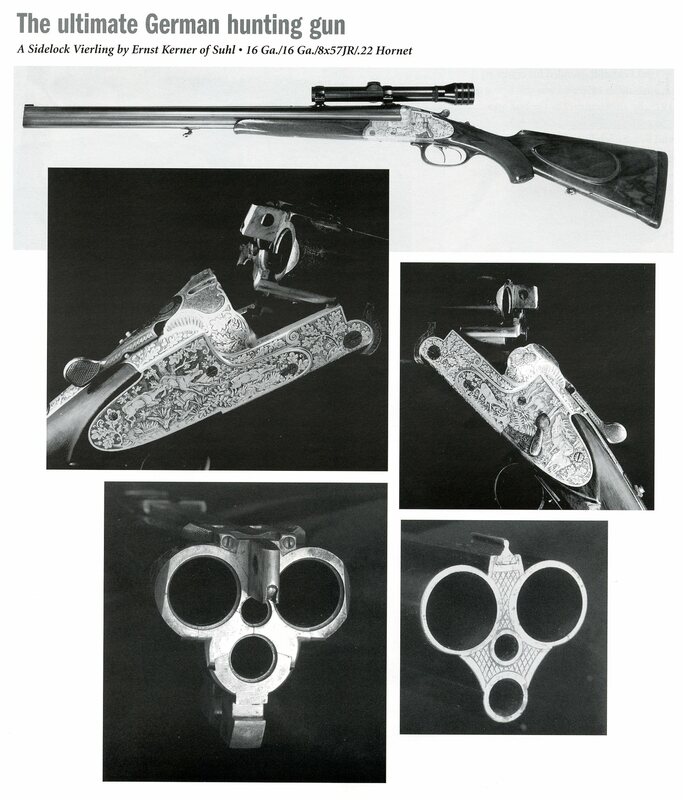 In 1939 the Stoeger Arms Co. of 507 Fifth Ave, New York , N.Y. offered in their catalog a three barrel combination gun made by Ernst Kerner & Co. as the Stoeger model 259L. In the March 12, 2013 auction of James D. Julia Co. one of these sold as lot no. 2220. 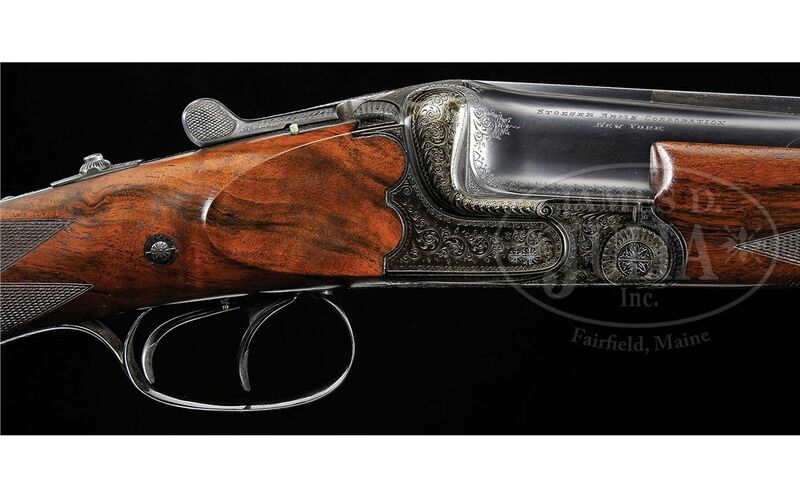 This is a BockDoppleBuschflint or a over-under double rifle shotgun. 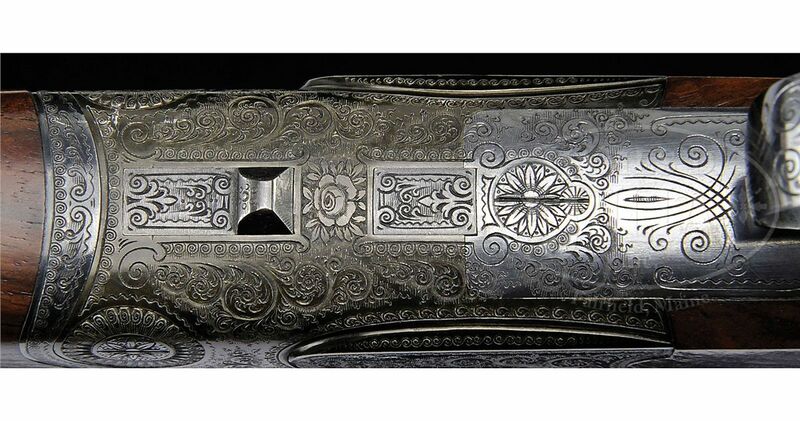 It is chambered for the 16 ga. shotgun, .30-30 Win. and 22 Hornet. The barrels are 23 5/8 inches long and are Krupp steel. The action is a Blitz trigger plate with a Dural (Aluminum) receiver. The condition was new and the hammer price was $6,750. The following images are courtesy of the James D. Julia Co.